The Humble Bundle has gained a lot of notoriety for selling PC games at super cheap prices and sending a ton of cash to charity. Now gaming giant EA is offering its own Humble Origin Bundle, with some of its best titles at rock bottom prices. For a minimum price of $1, you can pick up Mirror's Edge, Dead Space 3, Dead Space, Crysis 2: Maximum Edition, Medal of Honor, and Burnout Paradise: The Ultimate Box. Those who opt to pay the current average of $4.75 or more will also get Battlefield 3 and the Sims 3: Starter Pack which comes with the main game, Late Night Expansion Pack, and High-End Loft Stuff. Other than Sims 3, which will also run on Mac, all of the games in the bundle are for PC. Three of the best titles in the bundle, Battlefield 3, Dead Space 3 and Sims 3 will require the use of Origin, with the rest of the titles redeemable through both Steam and Origin. Even with the DRM requirements, there is no doubting the value to be had here, not to mention the fact that EA is donating its share of the proceeds entirely to charity. At the time of writing, the Humble Origin Bundle has sold over 800,000 copies and has raised over $3.7 million. Gamers can choose how to allocate their funds between the following five organizations: Human Rights Campaign, American Red Cross, Watsi, San Francisco AIDS Foundation and the American Cancer Society. 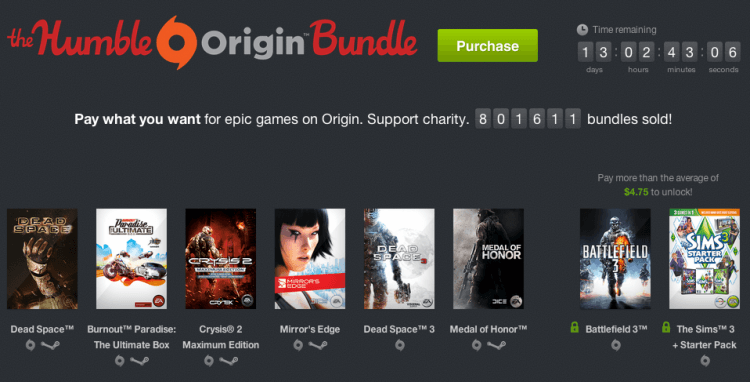 The Humble Origin Bundle will be available until August 28.